"When life gives you a bunch of limes, make lime curd! This twist on traditional lemon curd uses limes instead. Use it as a cake filling, or any other way you desire." Reduce heat to medium until water simmers. Slowly whisk egg mixture into the lime mixture. Cook over the double boiler until lime mixture thickens and coats the back of a wooden spoon, 20 to 25 minutes. Cool slightly and spoon into a clean, glass jar. Cover and refrigerate. Very very good! 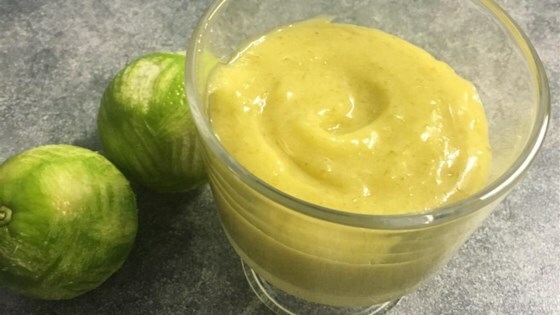 I've been looking for a lime curd recipe and this one is definitely it! I love that it is so simple and made with things I already have at home. Highly recommended! Really good! I used it as a topping for some mini-cheesecakes but I think I might make an entire pie out of it! This is a great lime curd recipe (and I've tried a few). Many recipes call for egg yolks only, but this was smooth and just creamy enough. A little grated ginger adds a nice twist. This was a super easy receipe. The taste was great. The only thing I did was pour thru a strainer after cooking. It gives it a more finished look!